Amazon's Choice for "dido for females toy"
Sold by Evizo Direct (4.8 out of 5 | 388 ratings) and Fulfilled by Amazon. Gift-wrap available. Sold by Evizo Direct and ships from Amazon Fulfillment. Ships from and sold by Shop Too Shop®. Sold by Party Propz and ships from Amazon Fulfillment. SGM mini massager, Blue, one size for neck, shoulders, face, muscles and tissue, eyes. Brief introduction: This wonderful mini massager, is an easy to use product, provides a steady relaxing massage to tired muscles. It can relax muscles on your back, shoulder, neck, arms, legs and face with its powerful vibration massage. You can adjust the massage intensity of portable massager with its powerful two speeds. It is a perfect personal massager for use anywhere. 2. Powerful 2-speed vibration massager up to 6000 RPM. 4. High, low massaging intensity. 5. Soothing massage for face, neck and shoulders. 6. Small size and light. 7. Operated by two AA batteries (not included in the package). 1. Unit size: 16 x 3.5 x 3.2 cm. 2. Net weight of the unit: 110 g.
3. Power: 2 AA batteries, 3V (not including). 4. Vibration speed: Low - 3600 RPM, high - 4700 RPM. 5. Packing: Colour box. 6. Box size: 6.8 x 4.5 x 17.5 cm. 1.0 out of 5 starsUseless product. Doesn't really provide any relief to the muscles or any relief from pains. The item doesn't serve the purpose. I was surprised to find a massager and pain reliever at such very low price and bought it for my neck pain. 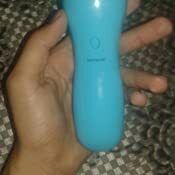 It proved that it is indeed a cheap product which can't be trusted as the whole item was vibrating while using it. No relief was felt and no stimulation of muscles were felt when this was used on the affected area. I bought this by seeing the many positive reviews which I now firmly believe were fake and paid reviews. Please do yourself a favor by not buying this and wasting your time. A useful massager for any one..we use it for providing chest physiotherapy for small babies at neonatal ICU and can be used for massage of bigger babies.. Very good product. Excellent quality material and touch and feel is smooth. Good product from Evizo. works as described easy to use and feels comfortable when used. Even value for money. Mostly suggested for adults.